Tajikistan is situated in central Asia and shares borders with Uzbekistan, Afghanistan, Kyrgyzstan and China. Between 1920 and 1991, the mountainous country was one of the Union of Soviet Socialist Republics (USSR). The Republic of Tajikistan has a population of more than 8.6 million residents and an estimated land area of 143.100 square kilometers. Dushanbe is the capital and also the largest city with a population of more than 770,000 people. Tajiki is the official language in Tajikistan, but Russian is widely spoken. Uzbek, Kyrgyzstan and Persian are the most significant minority languages. Islam is the predominant religion in the region and an overwhelming majority of Tajikistan’s population considers themselves sunni muslims. Impressive mountain ranges dominate the Tajik landscape, while the Pamir Highway (M41) used to form part of the Silk Road trade route. The hospitality of Tajikistan’s residents is definitely the main reason to visit this central Asian country. 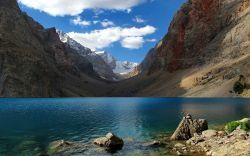 Nature lovers definitely feel at ease in Tajikistan due to the stunning mountains and beautiful lakes. Additionally, medieval buildings, the Tajik cuisine, fascinating traditions and low prices are some other reasons to visit Tajikistan. All types of gambling and betting are illegal in Tajikistan, although the mountainous country boasted several casinos in the past. That leaves gamblers no other option than playing at online gaming sites that are hosted in other countries. The government’s internet censor system mainly targets social media and sites relating to politics and news. That means Tajiks can freely enjoy casino games and sports betting on the worldwide web. It is reported that local authorities shut down illegal gambling dens on a regular basis, especially in the capital city of Dushanbe. Therefore, Tajiks and foreigners living in Tajikistan with a weak spot for gambling are forced to play in online casinos. It goes without saying that gambling fans who speak Russian and/ or English benefit from their language skills. The Asian Development Bank expects growth to weaken in 2017 (4.8 percent), followed by an accelerated rate of 5.5 percent in 2018. Furthermore, the Tajik GDP per capita PPP averaged $1,911 between 1990 until 2016. Inflation remains high in Tajikistan with an average rate of 13 percent between 1999 and 2016. Economists expect a 8.0 percent level in 2017 and a 7.0 percent rate in 2018. Moreover, Tajikistan’s unemployment rate remained steady in the period 2012 – 2016, with an average rate of 2.34 percent. However, the quickly growing workforce requires more jobs, which is a massive challenge for the government of Tajikistan. Poverty is another worrying issue as more than 30 percent of the population lives below the national poverty line. However, it’s worth noticing that significant progress has been made in terms of poverty reduction, according to the World Bank. Infant mortality is also high with 32.8 deaths per 1,000 live births. The internet penetration rate has climbed from 3.8 percent in 2006 to more than 21 percent in 2016. Additionally, Tajikistan’s mobile market has grown significantly over the last five years, and even 4G internet is available nowadays. Similarly to most countries on the globe, the usage of mobile devices continues to rise. To summarize, the increasing popularity of online gambling isn’t surprising considering the above mentioned findings. How to deposit money in an online casino when I’m from Tajikistan? Fancy to enjoy the thrill of virtual gambling after reading our “online casino Tajikistan” page? Head to Royal Panda and scoop a 100% first-deposit bonus!